The Dune ring is inspired by the book Dune, authored by Frank Herbert. 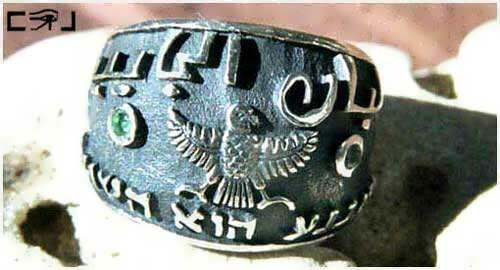 The translation of the Hebrew phrase engraved on the ring is: "That which submits rules" - A line taken from the book. These words hold the secret to true human enlightenment. 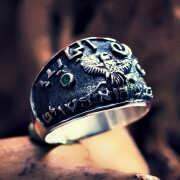 The hawk that appears in the center of the Dune ring is the emblem of the house of Atreides, from whom the "Qwitzat Haderach" emerges, is derived. The hawk represents the higher self, the witness who always sees the entire scene, "The big picture" symbolizes the perception of the "Cosmic Thought". The Dune ring's color combination of the green emerald stones mounted on a blackened surface represents the black and green flag of the house of Atreides. The green emerald also symbolizes the center and compassion of the heart. 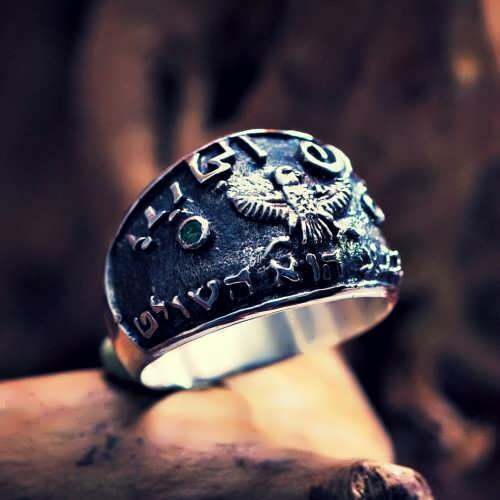 The inscription in Arabic writing on the Dune ring is a variation of Paul Atreides' Arabic nickname "Lisan il Gayeb", meaning "The language of the one who came". In order to emphasize his drive to understand the purpose of the cosmos, he used the metaphor of the “Spice Melange”, the most precious substance in the universe, that exists only on the desert planet Arrakis and enable the one who consumes it to expand his consciousness and literally see the future. That is the reason that the control of Arrakis is a coveted and dangerous as the forces of the empire confront each other in a struggle for the control of Arrakis and its "spice".